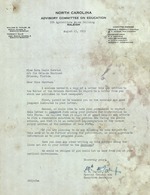 ﻿ Taylor, W.W. signed typewritten letter to Zora Neale Hurston, Raleigh. (1p. 8 1/2 x 11). Re: her letter written to the editor of Orlando Sentinel. Taylor, W.W. signed typewritten letter to Zora Neale Hurston, Raleigh. (1p. 8 1/2 x 11). Re: her letter written to the editor of Orlando Sentinel. which was published in. that newspaper. judgment indicated in your letter. policy address of. the Governor of this State. .
informaion as to your proposed plans. lines set out in your letter to the Sentinel?